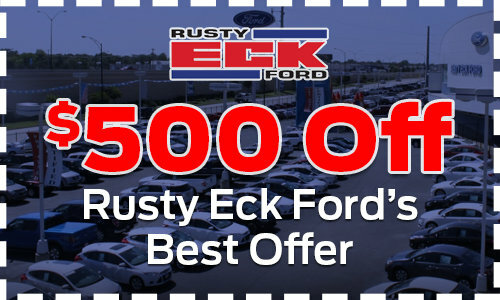 Why Buy From Rusty Eck Ford? * All prices listed plus tax and applicable fees. While we make every effort to ensure the data listed here is correct, there may be instances where some of the factory rebates, incentives, options or vehicle features may be listed incorrectly as we get data from multiple data sources. PLEASE MAKE SURE to confirm the details of this vehicle (such as what factory rebates you may or may not qualify for) with the dealer to ensure its accuracy. Dealer cannot be held liable for data that is listed incorrectly. New Used Commercial Videos Financing Service About Us Why Rusty Eck?